Our credit line. Your financial backup. Access it anywhere and anytime. Sign up in 10 minutes. Doesn’t matter if you want to finance online purchases or if you’re stuck in a financially difficult situation: once registered, you can use your cashpresso credit line anytime for anything you need. You can access the amount you need immediately after your registration at the touch of a button. You can pay out up to € 1,500 to a SEPA bank account of your choice. If you shop in one of our partner shops, you can pay for purchase of up to € 2,000, subject to a deposit of € 500. You can manage your credit line with your free cashpresso account. Transfer the amount you need to any bank account. You repay according to your wishes. The best part is: you do not need to commit to any one option, but can change your repayment options any time free of charge. In your account you can find an overview of your transactions. You will always be able to keep track of money borrowed and repaid. cashpresso does not charge overhead or maintenance fees. If you sign up but do not use your account, you will not pay anything. All we charge is an interest rate of 14.99% of the amount of money you actually borrow. Borrow some, repay some, and borrow some again. No need to reapply. You decide how much you repay. That’s how you decide the duration of your repayment. Works just within one click in your cashpresso account. That’s it and nothing more. Extend your line of credit. Log in to your cashpresso account and invite your friends to give cashpresso a try. To say thank you, we will extend your line of credit with € 50 for every friend that follows your invitation. This way, you will have access to up to € 250 more. 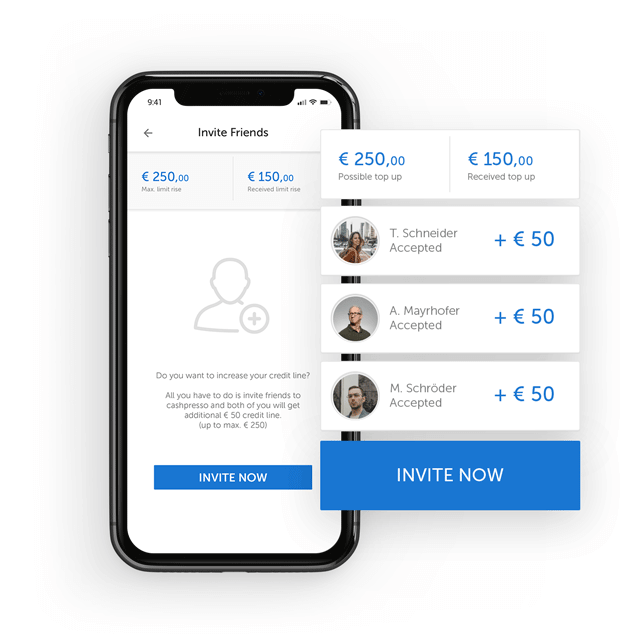 Invite your friends by sending the invitation link via e-mail oder share the link on social media channels or WhatsApp. If you want to pay as small installments as possible, then choose the repayment based on the minimum rate. Your rate is calculated each month, always from the current amount, but never falls below 5% of the outstanding amout or € 20. You can decide for yourself the amount of your monthly rate and the day when the rate is debited from your account. Of course, you have the possibility to change the selected instalment rate at any time and always pay additional amounts. If you would like to pay a portion of the outstanding amount in addition to the monthly rate, you can do so at any time. A fee does not apply. You do not need to inform cashpresso in advance about the partial payment. You can find a complete overview of the cashpresso rates and terms here. Representative example according to §6a ABs. 4 PAngV: € 1,000 withdrawal to a bank account, 10 instalments à € 100, 1 instalment à € 67.50, total € 1,067.50, duration 11 months, 14.99% APR per year, 13.99% nominal interest per year. You only need to confirm your email address and provide top-of-your-head personal data. Proof your identity by holding your ID towards the camera and sign your contract electronically. Transfer how much money you need immediately after the video call to any SEPA-account. Every money transfer must be confirmed by entering a TAN. This TAN is sent to your mobile phone via text message and is only valid for 5 minutes. If your smartphone includes a fingerprint sensor you can use it to log in into your cashpresso account. If not, you log in entering your email address and password. 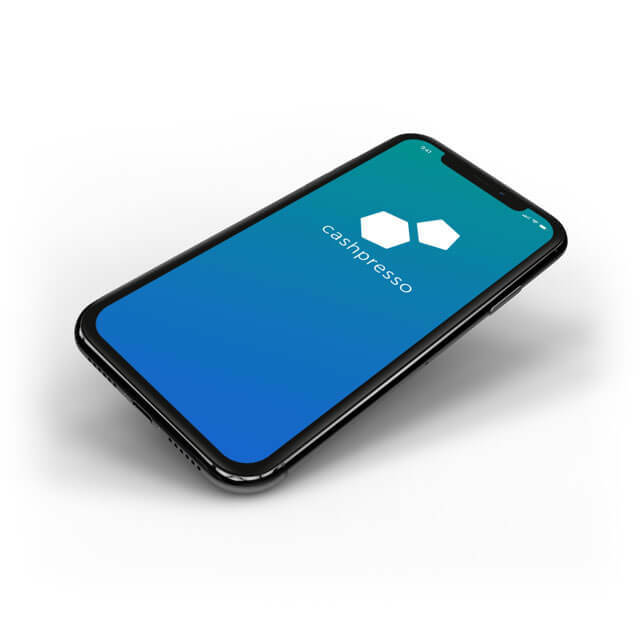 cashpresso is not only focused on usability but also on security. If you are inactive for 5 minutes our app as well as our online portal will ask you to log in again. If you are changing important contact details like email or phone number you’ll be informed immediately – if it wasn’t you who did the changes, you can block your account within one click. 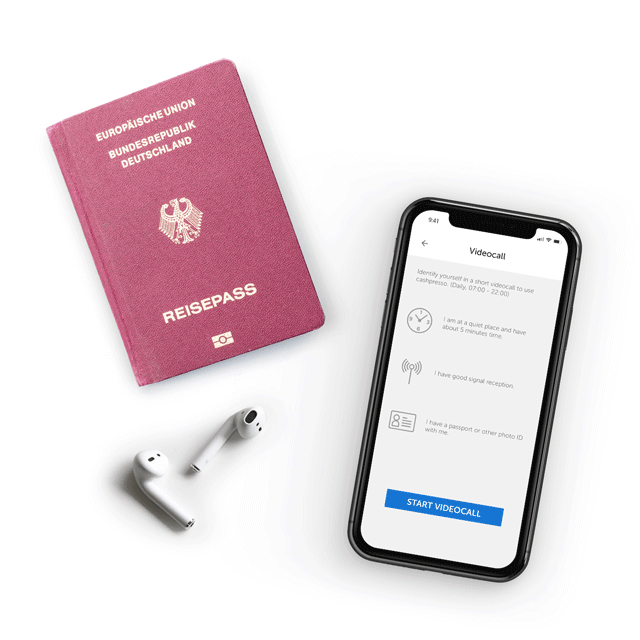 cashpresso credit lines are offered in cooperation with Deutsche Handelsbank AG.